President Donald Trump issued an all-caps threat to Iran after the country's president said earlier in the day that pursuing hostilities against his country could lead to "the mother of all wars." The tweet was sent at 11:24 p.m., after the president returned to the White House from spending the weekend at his golf club in Bedminster, New Jersey. Trump wrote, "To Iranian President Rouhani: NEVER, EVER THREATEN THE UNITED STATES AGAIN OR YOU WILL SUFFER CONSEQUENCES THE LIKES OF WHICH FEW THROUGHOUT HISTORY HAVE EVER SUFFERED BEFORE. WE ARE NO LONGER A COUNTRY THAT WILL STAND FOR YOUR DEMENTED WORDS OF VIOLENCE & DEATH. BE CAUTIOUS!" The comments came at the same time as Secretary of State Mike Pompeo was speaking at a Reagan Forum in Simi Valley, California, on the topic of Iran. Pompeo blasted the country for corruption and human rights abuses -- but also offered direct talks with the regime. Ten minutes into his speech, he was heckled by a protester, who shouted about the Trump administration "kidnapping children." The protester continued to shout, but she was drowned out by audience members shouting her down, and chants of "USA! USA!" The chaotic scene lasted for 30 seconds or so, with Pompeo eventually quipping, "If there were only so much freedom of expression in Iran," to cheers and applause. 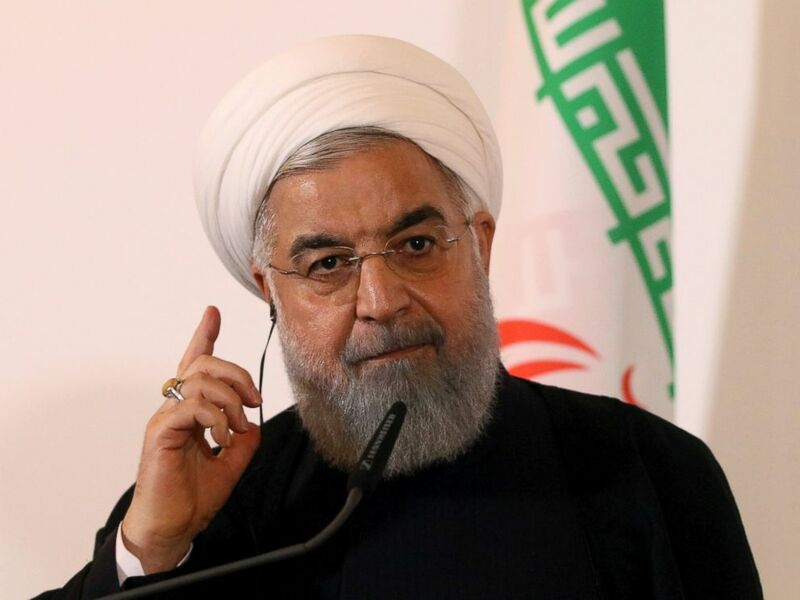 Iranian President Hassan Rouhani issued his threat to the U.S. at a gathering of diplomats, according to the state-run Islamic Republic News Agency. "Mr. Trump, don’t play with the lion’s tail, this would only lead to regret," the IRNA reported. "America should know that peace with Iran is the mother of all peace, and war with Iran is the mother of all wars." Pompeo did say the U.S. was willing to talk with Iran, as Trump has said in the past, but real change can only come with change in the regime's behavior: "We are willing to talk with the regime in Iran, but relief from American pressure will only come when we see tangible, demonstrated and sustained shifts in Tehran’s policies," he said. The U.S. is "undertaking a diplomatic and financial pressure campaign to cut off the funds that the regime uses to enrich itself and support death and destruction," Pompeo said. Despite some mixed messages from senior State Department officials in recent weeks, Pompeo made clear that pressure campaign includes dropping Iranian oil imports to "as close to zero as possible by Nov. 4" when U.S. sanctions snap back into place. The U.S. is also launching a 24/7 Farsi-language channel across mediums to dispel the "fake news ... that America is the Great Satan" and "so that ordinary Iranians in Iran and around the globe can know America stands with them." As Trump has done repeatedly, Pompeo blasted the Iran nuclear deal, saying it didn’t make Iran more moderate, "it made them wolves in sheep’s clothing." He said moderates in Iran are "unicorns," including Rouhani and Foreign Minister Mohammad Javad Zarif -- the "polished frontmen for the ayatollahs' international con artistry."